Nantucket Community Sailing - Support NCS - Donate a Boat | Donate a boat and help keep NCS afloat! Donate a boat and help keep NCS afloat! Boats in good condition may be donated for use in the NCS programs. Many of the Rhodes 19's we use at the Jetties Sailing Center, were given to NCS from various Island individuals who no longer wanted to or had the ability to keep up their boats and store them. Also, both of the NCS J105's were donated and now we have our Keelboat program! If you think you have a boat to donate to NCS, please contact the Main Office at (508) 228-6600 for more information. Some of these donors have become repeat members of the NCS Jetties Sailing Center. We frequently hear people say that they love seeing their old boats getting so much use and really enjoy that being a member of the JSC allows them the chance to get out on the water without all the hassle of owning a boat! Our goal is to continually recycle boats within our program every three to four years. This is to ensure NCS maintains a consistently upgraded fleet to meet the needs and growing abilities of our students. Cycling the boats in and out will also cut down the high costs of maintenance and upkeep older boats require. Those who purchase a boat for NCS will have the opportunity to name the boat and receive a 501(c)(3) tax deductible letter from NCS. If you're ever in Polpis Harbor on a warm summer morning, be sure to check out the Opti's The Bank (donated by Nantucket Bank), Aunt Eula (donated by a friend of NCS in honor of his Aunt) and Wampanoag (donated by an NCS friend to honor Nantucket's Native American history)! 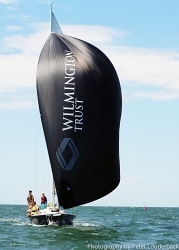 Purchase a sail for NCS Prams/ Opti's boats and we will put your name or logo on the sail. Contact NCS at (508) 228-6600 and ask for Diana Brown for more details. This great shot of NCS's J/105 Clio was taken by Peter Louderback during Nantucket Race Week!